Artist's concept of Russia's new Angara rocket on the launchpad. Russia is preparing for the debut flight of a launch vehicle called Angara, its first new big rocket since the Soviet era. Angara is built around common core boosters that burn environmentally friendly liquid oxygen and kerosene (like SpaceX’s Falcon rockets). 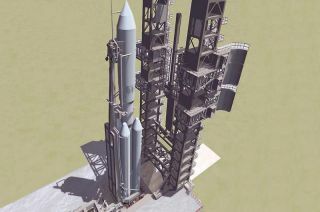 By adding additional liquid rocket boosters to the first stage, Angara’s lift capacity can be increased to handle heavy payloads, similar to SpaceX’s Falcon Heavy, which is currently under development. Like the Falcon, Angara uses the same liquid fuel boosters throughout the rocket, not solid rocket motors like what United Launch Alliance adds to boost its Atlas and Delta rockets’ lift capacities. A prototype of Russia's Angara rocket at the Khrunichev assembly facility. Angara rockets will launch from Russia’s Plesetsk Cosmodrome, breaking Russia’s reliance on Kazakhstan, which took over the Baikonur Cosmodrome after the Soviet Union dissolved in 1991. Angara rockets also can fly from Russia’s Vostochny Cosmodrome, which currently is under construction in the far eastern Amur region. Last week, a full-scale Angara engineering mockup was rolled out of the Plesetsk’s Integration and Test Facility and onto the launchpad for ground support systems testing. Russian Prime Minister Dmitry Medvedev, who toured the launch site on Wednesday (Feb. 19), said the rocket was on track for a test flight in the second half of the year, RIA Novosti reported.